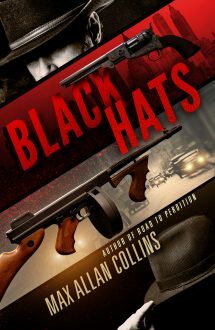 [Collins] once again shows himself a master at the historical thriller. In 1920, 70-year-old Wyatt Earp, who's working as a PI in Los Angeles, is hired by "Big Nosed Kate" Elder, the widow of his best friend, Doc Holliday. Kate wants Wyatt to go to New York and help her speakeasy-owning son, John (fathered by Doc as he was dying), who has fallen afoul of a local tough guy, the young Alphonse Capone. In New York, Wyatt teams with another old pal, Morning Telegraph sportswriter Bat Masterson. It's a fabulous setup, and Collins has all the skills and experience to bring these great characters leaping off the page. The bad guys may have organized gangs and tommy guns, but in the end these whippersnappers are no match for Wyatt's cunning and 10-inch-long-barreled .45. The exigencies of historical fact force Culhane into a tamer ending than some readers might like, but the sheer fun of riding along with the two old lawmen and their memories will run roughshod over any quibbles or complaints. Collins pits storied lawman Wyatt Earp against crime's greatest gangster, Al Capone, in this engaging flight of fancy. The premise is not as outlandish as it initially sounds, as Earp was in fact a detective of sorts in Los Angeles in the early 1920s, where this story begins. Doc Holliday's widow commissions the spry 70-year-old to head east to New York, where Doc's son, Johnny, owns a speakeasy. Along with his old pal Bat Masterson, Earp finds in Holliday's lucrative speak the promise of a gold rush and figures to cash in himself, until a gang of Brooklyn bootleggers issues a promising young thug named Capone to muscle in on the works. Earp and Capone are ultimately both fortune hunters, neither afraid to work some lead into the air to get what they want. The legendary heat these marquee names come packing provides most of the enjoyment here. The rest comes from picturing an anachronism with a 12-inch .45 and a broad-brimmed Stetson walking the streets of freshly Prohibited New York.